I went to visit family in Oregon on Memorial Day weekend of 2001. I was planning to attend two events involving my family. On Friday evening the 25th, my mother was singing in a choral concert presenting African music. On Sunday the 27th, I planned to attend my niece's college graduation ceremonies. In early May I booked a round trip ticket through the Amtrak website. This was my first time using their on-line reservation system. 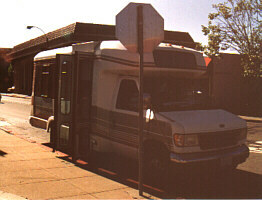 My reservation included the Amtrak Throughway bus from the transit plaza in downtown Monterey. My reservation was confirmed on the spot and my tickets arrived in the mail about two weeks later. This would be my first trip on the Coast Starlight since 1984. I was long overdue. At 4:00pm I went on-line to determine if Train #14, the northbound Coast Starlight, scheduled to leave at 6:47pm, would be on time. It reported that the train was 11 minutes late. At 5:15pm my wife Heidi dropped me at the Monterey Transit Plaza to meet the Amtrak bus. It was waiting for me when we got there, but wouldn't depart for another 15 minutes. I gave the driver my suitcase then we went across the street to buy a pocket notebook to keep a log of my trip. After a few hugs and kisses I was on the bus, and on my way. Two senior ladies were the only other passengers. Our next stop was the Hyatt Regency, where we waited for five minutes, but no other passengers showed. The driver took us to Salinas via Reservation Road through Marina. This little mini bus, really nothing more than expanded van, was a noisy, bouncy, rattling contraption, and not especially comfortable. But for a short trip it was adequate. We arrived at the station at 6:09pm. I got into line at the counter to check my bag. Ahead of me was one of the two ladies from the bus, the other was behind me. We all looked up at a sign over the counter which said the train would be almost an hour late. I asked the woman in front of me where she was going. She said "south." Uh-oh. I told her the evening train was going north. She said, no, she had a confirmed reservation for a train south at 6:47pm. I asked her which city she was going to and much to my relief she said "Davis." "That's north." I told her. "Is it?" she said, "My mind must be going." She was from Carmel, and this was her first train trip. The lady behind me was destined for Sacramento, where she lived. It was also her first trip on Amtrak. It might be her last as she was not happy about the prospect for a 1:00am arrival in Sacramento. The clerk was a quiet fellow, and didn't say much until I asked him about the train. He said it is often delayed by freight traffic near Paso Robles, where it would have been shortly after I had checked it on-line. I spent some time photographing the station. It is a pretty little building, but rather tired looking. On a frieze there is a mural depicting the old Southern Pacific Daylight passing through Salinas Valley farms. I made some photos of the station, then went sat outside in the fresh air. At 7:05 the station attendant said the train would arrive in 30 minutes. At 7:30 I noticed the signal down the tracks had turned yellow. A good sign. Within a couple of minutes the signal turned red. I learned back in the '70s that meant the train was coming. When I said I saw a red light the attendant said that meant the train was close, then joked "about 20 miles away!" But within a minute it was in front of us. It was a good long train. The train consisted of one Genesis locomotive, one F40 locomotive, a baggage car, one transition sleeper (crew car), three sleepers, a Pacific Parlor Car, diner, sightseer lounge, and five coaches. The second to last coach stopped in front of the station, leaving the sleepers a long way ahead. The doors opened and out jumped a coach attendant and a conductor. They inquired about our destinations and directed each of us to the appropriate car. I was directed into the car right in front of me, which was #1414. That was the same number my mother and I had on our first northbound trip on this train in 1974. The coaches were numbered 1411-1415 from front to rear. The attendant, a man named Shelly, took me to the top of the stairs and showed me my seat, #29 on the right (east) side of the train. I had two seats to myself, and hoped it would stay that way through the trip. It would make sleeping much easier. At 7:37 we were moving out. As we glided along through the Salinas Valley it felt like heaven to be back on this train, or any train for that matter. All my cares began to melt away. I enjoyed the scenery out my window for awhile, then went to the rear of the train to watch the tracks recede behind the back door. I noticed that car, #1415, had electrical outlets for laptops at every seat. It was the only one I saw on this trip with that feature. At 8:00pm I went to the diner to inquire about dinner reservations. The steward, Von, told me to listen for last call around 8:30 and there would be plenty of room for me. On the way back I stopped to visit the children's play room on the lower level of car 1412,.I also saw the lady who was going to Sacramento and I asked her if she knew how to get dinner. She didn't so I repeated what the steward had told me. As I waited for dinner I looked around my car. 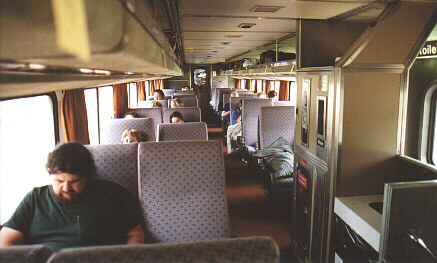 The upholstery was the newer pink and grey design, but the curtains were still the old orange color from the Superliner I era. Obviously this was a refurbished car. At 8:10pm we were passing a number of GraniteRock hoppers full of gravel or something grey. We soon entered what looked like a massive quarry and what looked like a cement factory. It was an impressive facility. At 8:25 we were passing Gilroy. Then came the last call for dinner and I made my way to the diner. Von seated me with three other individuals. Next to me was a young lady named Misty with orange tinted hair and lots of earrings. She was from Salem, now living with her military husband in Oceanside. She was on her way to Salem to visit friends. She was riding in coach. Across the table was a young couple from San Francisco. They were returning from a trip to the southland in a sleeper. He looked a little scroungy, being dressed in just a white v-neck T-shirt and he wore a hat at the table. But they turned out to be a very sweet couple. Among other things, we talked about movies that had been made on the Monterey Peninsula. The woman said I should see "Racing with the Moon" which she believed was filmed in Monterey. Since that is not on the official list, I will have to check it out. The young lady to my left was homesick for Salem, as her situation near a military base was very unpleasant. Evidently she was now living in a high-crime area, something she was not used to. She thought that was typical of California, but the rest of us assured her that was not the case. We told her that something farther north would probably be more to her liking. For dinner I ordered grilled snapper. Misty and the fellow across from me ordered the mushroom stuffed chicken breast, while his companion ordered the spinach lasagna. The prices were a bit higher than I had anticipated, running $14.50 for the chicken and $16.00 for the fish. On the California Zephyr last year entrees were in the $10.00 to $12.00 range. The fish turned out to be somewhat disappointing. It just didn't taste very fresh. When my companions asked how I liked it I told them just that. At that moment the server appeared and asked how things were. I repeated my complaint, and she asked if I wanted anything else. I said I'd have the chicken, which my companions seemed to be enjoying. Within two minutes I had chicken and it was excellent. The fish was the only disappointment I encountered in the diner. During dinner we stopped in San Jose at 9:10pm, about 50 minutes late. 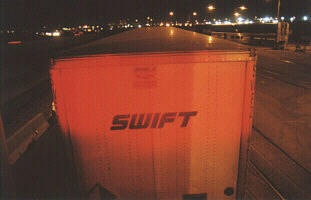 We could see inside some Caltrain cars which were alongside us, and they didn't look too appealing. I had seen the inside of one during an open house a few years earlier and I was not impressed then, either. After dinner I returned to my seat and pulled out a magazine to read. At 10:35, we were at Oakland's Jack London Square station, one hour and 10 minutes late. When we stopped I decided to buy a muffin and apple juice from the snack bar in case I got hungry in the night. Karen, the attendent was busy restocking her shelves with goods picked up at the station, so I had to wait a few minutes for service. No problem. When I returned to my seat I drank half of the juice but saved the muffin for later. They announced that we would soon be pulling into the switching yards to attach two roadrailers (truck trailers with rail wheels attached). We pulled out of Oakland at 10:53, down the middle of a street, then into the yard. There was an interesting assortment of Amtrak equipment there, including at least two trainsets of California Cars, a couple of Surfliner cars, and two locomotives in Surfliner colors, one F59PH and one older F40. 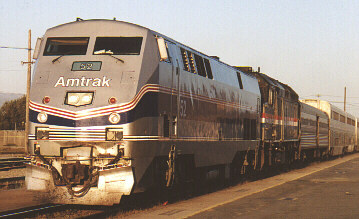 An Amtrak California locomotive was attached to an Amtrak baggage car which said "mail only" on the side. After the roadrailers were attached the man behind me, who I later learned was named Dave, went back to have a look. I had never seen a roadrailer before and neither had he. He encourage me to go back and check it out, which I did. Curiously, the last car, #1415, was completely empty but filled up again at Emeryville. Throughout the night Shelly had placed all single travelers in two seats, as there was plenty of room. Shelly had responsibility for cars 1415 and 1414. Another attendant took care of 1411 and 1412, and they shared responsibility for car 1413, the one in the middle. By 11:25 we were moving again towards Emeryville where we stopped at 11:42pm, 1 hour and 22 minutes late. There were a lot of people waiting to board here. Our next stop was Martinez at 12:35, 1 hour and 35 minutes late. A handful of people boarded. Shortly thereafter I went downstairs to brush my teeth and prepare for the night. I was again grateful to Heidi for finding the toiletry kit that hangs on a coat hook. We bought it for our trip on the California Zephyr last year, and it really helps in those tiny Superliner rest rooms. As I had discovered on my last coach trip on Superliner equipment, way back in 1984, the handicapped restroom is the only one with room to move around, and it is always the cleanest one in the car. But as much as I like Superliner cars overall ,the rest rooms are, in my humble opinion, their worst feature. The designers really need to re-think the entire arrangement. Even the handicapped rest room, while much more spacious overall, places the toilet and sink too close together for comfort. The floor space in the standard rest room is only about 18 inches square. Toilet paper rolls must be left loose on the counter, because the holder is too close to reach without making unnatural bodily contortions. The sink faucets are under too much pressure and often splatter. Two dressing rooms, one for ladies and one for men, were provided, and they were somewhat better, having a small anteroom with a bench, but the basic arrangement of the toilet and sink is still cramped. Designers need to look back to the Streamliner era, when rest rooms had full sized toilets in compartments large enough to move around in, while sinks were in a separate anteroom. It might require sacrificing one toilet to make the others bigger, but that would not be a serious inconvenience because there was always at least one toilet open at any given time. I settled into my seat and moved the seat back as far as it would go. I raised the leg rests on both seats, propped my little "mini-muffin" Amtrak pillow in the corner, and kicked off my shoes. I spent a little bit of time finding the most comfortable position and closed my eyes. We arrived in Davis at 1:30am. I looked up but couldn't see the station as we were too far back. I recognized the trees on my right from my last trip on the California Zephyr. As we pulled out I could see the station as we passed. At 1:48 we were crossing the Sacramento River. The Sacramento station lay just on the other side where we stopped about two hours late. While boarding at such a late hour one woman said she would never take Amtrak again. We departed Sacramento at 2:17 by backing up! We went back over the river, stopped then moved forward again, this time turning north just before the bridge. From here on I slept in short intervals. Each one a bit longer than the one before. I would wake up, rearrange, then go back to sleep. At one point I put on my sweatshirt as I was getting a little chilly. I woke up at 4:00am in Chico and saw they had a very pretty little station. Its too bad the train only served it in the wee hours of the morning.